I’ve preserved the original structure of the JSON response as much as possible, and have made minimal alterations beyond those descibed in the below section “Dictionary library module”. One change is returning <dictionary> as the root XML element, which has the attibutes input and language. The input attribute is assigned a value matching the ‘word’ sent to the Oxford Dictionaries API, and is equivalent to the API’s word_id parameter. Likewise, the language attribute is assigned a value equivalent to the API’s source_lang parameter. As a result, <dictionary input="ace" language="en"> allows us to create efficient XML queries on cached dictionary data from English related to the string ‘ace’. Another addition is a <date> element within the <metadata> element. Text content within <date> is from the response header received from the Oxford Dictionaries API. 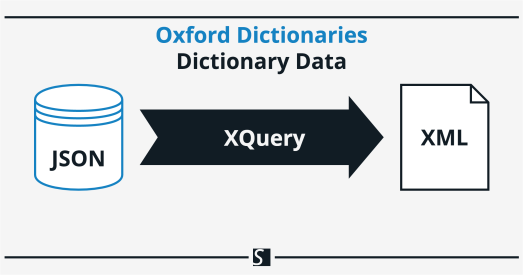 This is useful for evaluating whether or not to update cached dictionary data by making a new request for a given word_id to the Oxford Dictionaries API. "text": "Ace! You've done it!"